The DEWCO team had great fun supporting the annual RNLI Fun Day on Mudeford Quay in Dorset. We entered with our very own handmade raft constructed from 8 barrels and upcycled materials from our workshop. 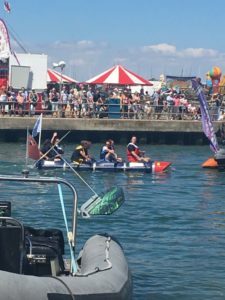 With oars made from recycled plastic, industrial foam used for added bouyancy and a branded DEWCO flag we set sail on one of the hottest days of the year. After qualifying for the final, we finished in a very respectable 4th place.